Here is a Lovely 1950’s Super Mondia, Special Model, with Photos provided by Norbi of Norbibike 2009. Made from Reynolds 531 Butted tubing with Simplex Droputs. The fork crown is a Wagner flat top crown with a graceful bend to the fork blades. Stock braze ons include brake cable guide stops on the top tube, single Simplex down tube shifter boss and shifter guide cable stops for the rear deraileur. Note the Rear deraileur was upgraded at one time from a Simplex to a Campagnolo Gran Sport rear deraileur a common practice at a time when new designs arrived on the scene. 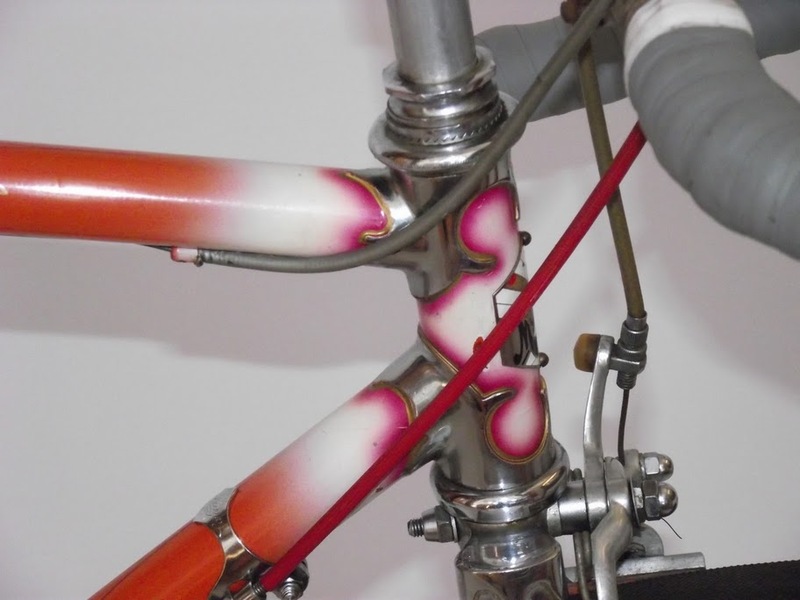 Note the typical fade paint work that many Swiss bicycle firms provided during this time. 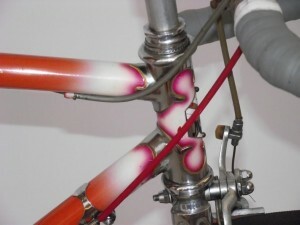 Fade work often was of two or three color changes most notibly at the Head lugs and on the seat tube. 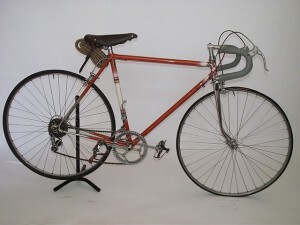 The Headset of this bike appears to be a Corevelo Grand Luxe which would be period correct for this era. Weinmann side pull brakes common in the early 1950’s were slowly phased out for the more preferable Weinmann 999 center pull brakes that provided better stoping power. This indicates this maybe a frame from the early 1950s. Classic and often ornate Script decals were common during this time to embellish the frame with extra touches that define Swiss bicycles. Hand Pin Stripping was another mark of many of the bicycles along the top, down tubes. Seat and chain stays often received the pin stripping treatment. When I toured the Allegro Factory in Marin, Switzerland in 1976 I observed female workers free hand the pinstripping effortlessly, demonstrating their years of practice. 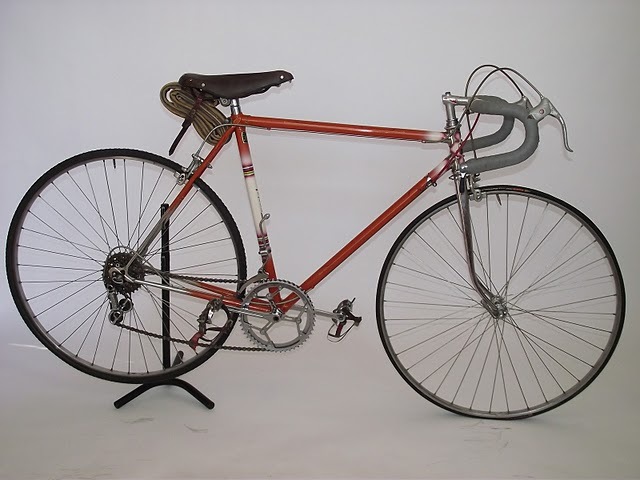 This was the last of the era, soon, bolder plain grafics and the dissapearance of pin stripping became the direction of racing bicycles from Switzerland. 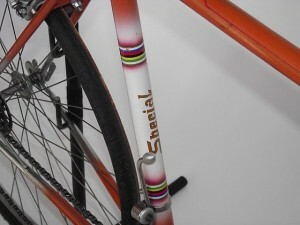 The seat tube shows this bike to be a Special Model. More of the fade paint work seperating the World Championship decals denoting that Monida had a World Champion rider in the past. This is always a souce of pride and a sales boost for the factories. 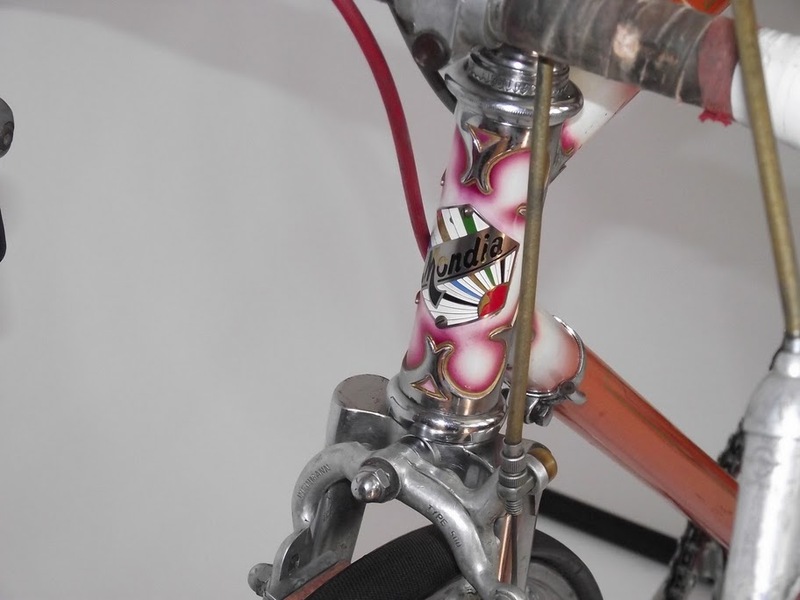 The Simplex down tube shifter boss for the rear deraileur also indicate an early 1950s frame along with the Simplex hand shift front deraileur. The hand shift front deraileur would soon dissappear and be replaced by cable front deraileurs. Cable guide stops would slowly dissappear also only to reappear again at a late date. 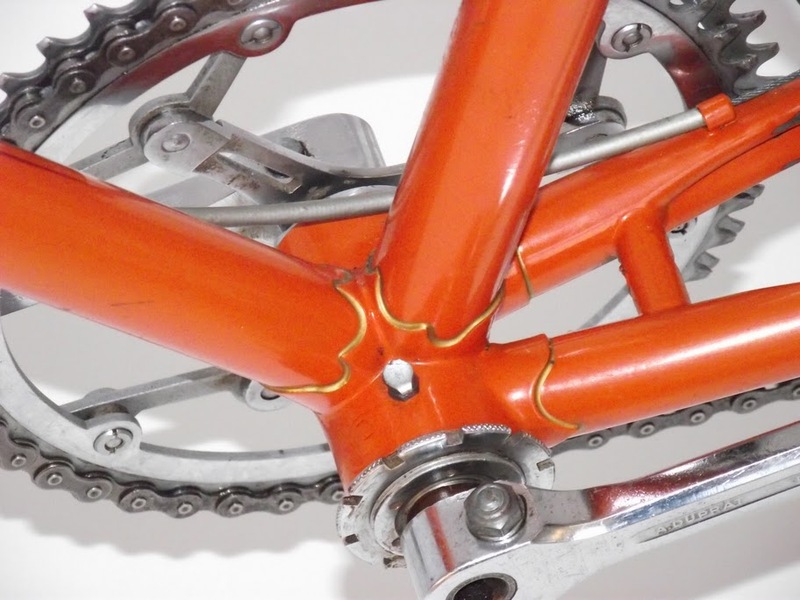 As braze ons were no longer on frames so also bottom bracket grease ports were no longer added and became an identifer of the old ways of building bikes. This was possibly due to less racing on the dusty dirt roads of the early years of racing. 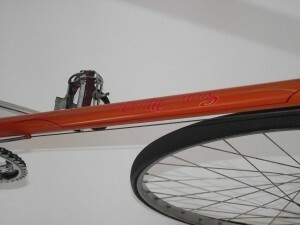 Lug lining as shown in this photo helped show off the hand work of lugs and bottom brackets and gave an visual appeal. Steel crank sets also were soon replaced by aluminum racing sets made by Stronglight ( models 49D, 57 and 63), along with Campagnolo which began to manufacture crank sets in 1958. 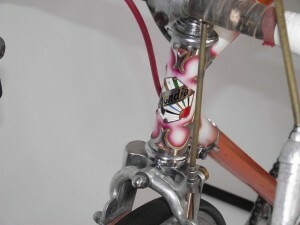 Mondia Head Badge shown here is framed by beautiful lugs and paint work. Weinmann 500 side pull brake clamped to the flat top Wagner fork crown. Check my Links Page for links to Robert Broderick’s site that has more information on a Mondia timeline.